If the weather warms up sufficiently in January or February, honeybees take advantage of it and use this opportunity to leave their hive to rid themselves of waste that they have accumulated since their last flight and to remove the bodies of dead honeybees. They don’t fly very far before dropping either their waste or their dead comrades on the snow. This ritual is quickly noted and taken advantage of by animals that are not hive dwellers and need constant fuel in order to survive the cold. 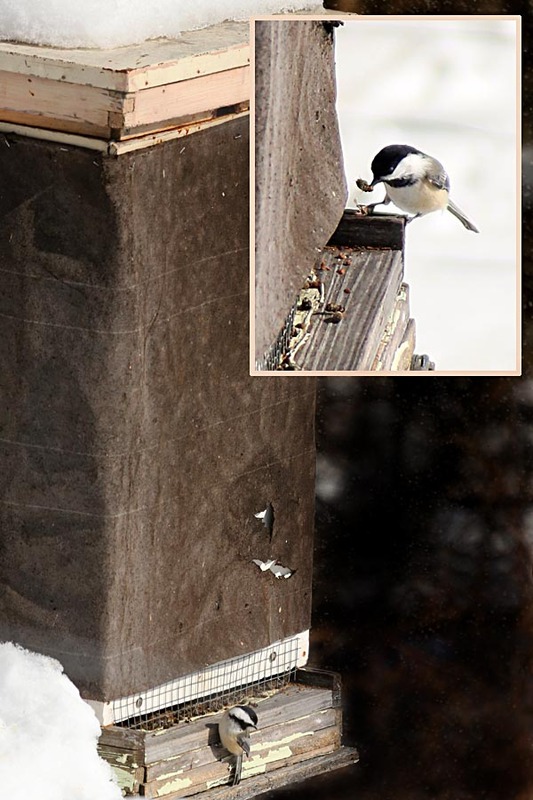 Black-capped chickadees are one of these animals – the chickadee in this photograph repeatedly landed on the hive body, and if a dead bee was available at the hive entrance, the chickadee helped itself to it. Otherwise it would survey the snow in front of the hive and then dart down to scoop up a bee in its beak before flying off to a branch to consume its nutritious meal. (Note dead bees at the hive opening, awaiting being taken on their final flight. Screening keeps mice out, but allows bee to enter and exit.) Thanks to Chiho Kaneko and Jeffrey Hamelman for photo op. Bobcats and Canada Lynx are in the same genus, and are roughly the same size (averaging 15 to 35 pounds), with Bobcats usually weighing a bit more than Lynx. The size of their feet is vastly different, however, and not proportional to their relative weights. A Lynx has much larger feet and longer legs than a Bobcat. Its range extends further north, which means it must be well equipped to deal with snow much of the year. A Lynx has big, furry paws, and when its feet land the toes spread way out. 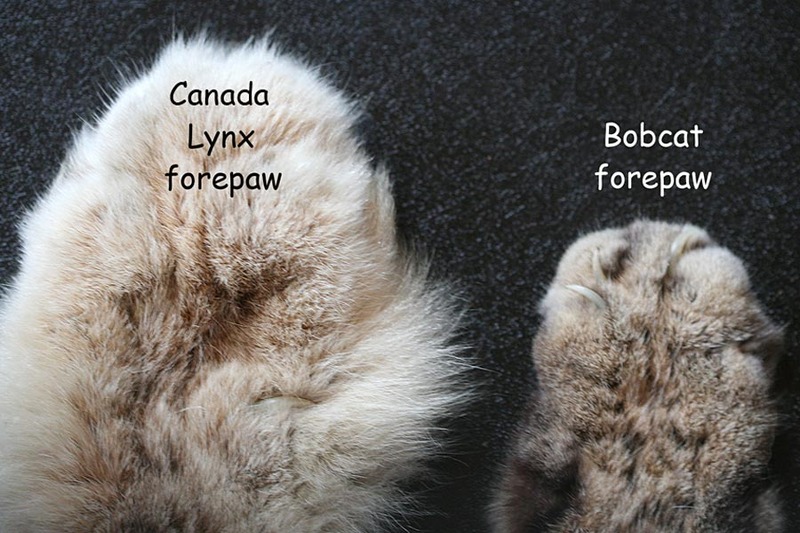 Both of these adaptations help a Lynx’s feet act like snowshoes, helping it to chase down food in the winter. Much of the time, this food consists of Snowshoe Hares –anywhere from 60 to 90 percent of the diet of Lynx is made up of hares. The soles of Snowshoe Hare feet are also well-furred, particularly in winter, enabling them to run on soft, deep snow without sinking in very far. Because Snowshoe Hares are extremely fast and agile (reaching speeds of 30 mph and jumping 12 feet in a single bound), the feet of any serious predator must also be well adapted to traveling on snow. Note: Bobcat sightings are much more frequent than Lynx in northern New England (the southern tip of the Lynx’s range) but breeding populations of Lynx have been documented in the last two years in the boreal forests of Maine, New Hampshire and Vermont. 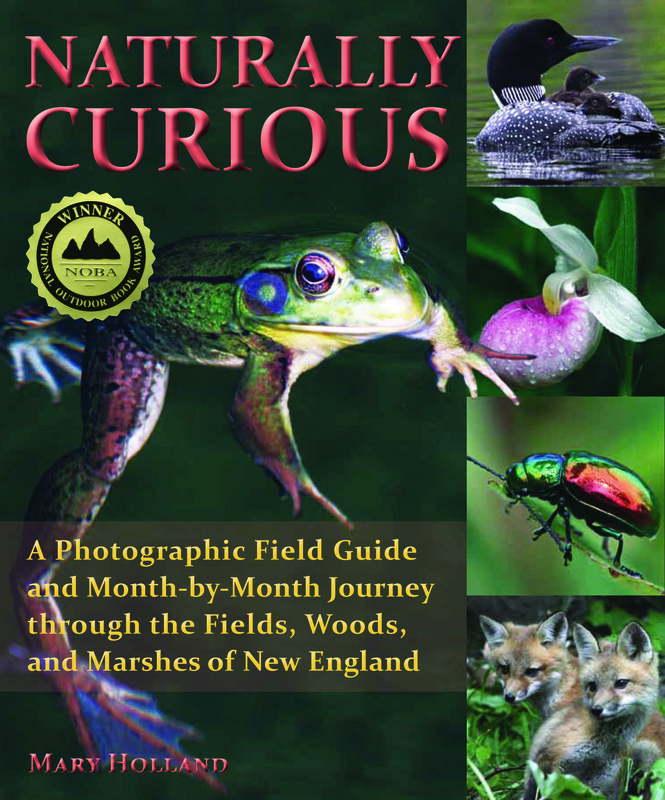 If you’re looking for a present for someone that will be used year round, year after year, Naturally Curious may just fit the bill. A relative, a friend, your child’s school teacher – it’s the gift that keeps on giving to both young and old! 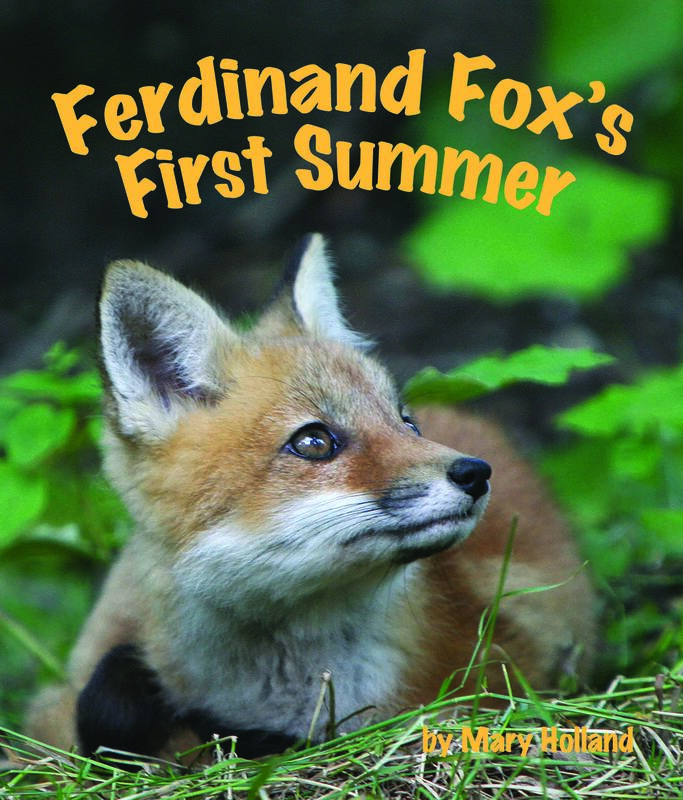 I am a firm believer in fostering a love of nature in young children – the younger the better — but I admit that when I wrote Naturally Curious, I was writing it with adults in mind. It delights me no end to know that children don’t even need a grown-up middleman to enjoy it! Northern Watersnakes can be found in rivers, ponds and bogs throughout New England, except for northern Vermont, New Hampshire and Maine. They spend time foraging both day and night for fish (61% of diet), frogs and toads (21%), salamanders (12%) as well as insects and crayfish at the water’s edge. 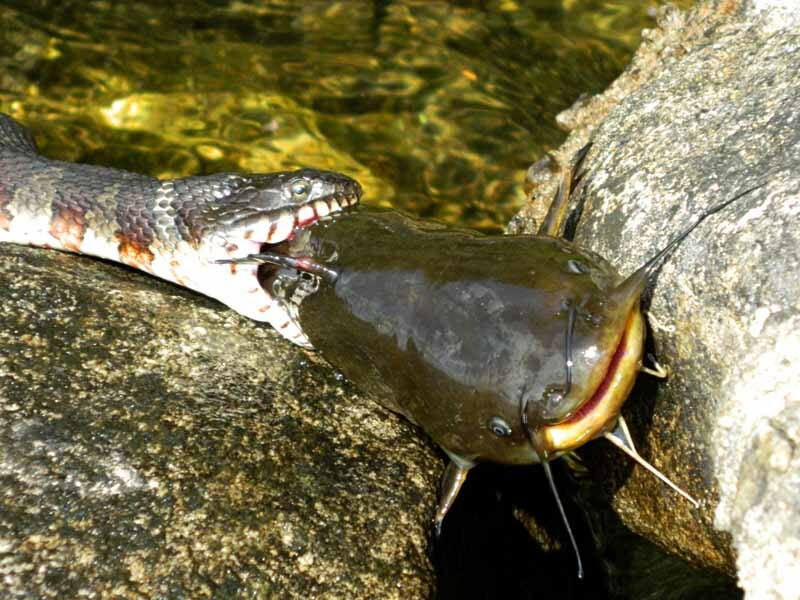 (Snake jaws can separate at both the front and back, allowing them to eat impossibly large prey , such as the catfish in Chris Crowley’s photograph.) They also spend a great deal of time basking on rocks and overhanging branches. Northern Watersnakes can be formidable looking – they can grow over four feet long – but while they can be aggressive if threatened, they are not poisonous. Watersnakes give birth to up to 70 (typically 20-40) live young between August and early October. Common Mergansers are primarily fish-eating ducks. Young mergansers require over half a pound of food per day during their first summer, and often supplement their fish diet with insects, mollusks, crustaceans, worms, frogs, small mammals, birds and plants. 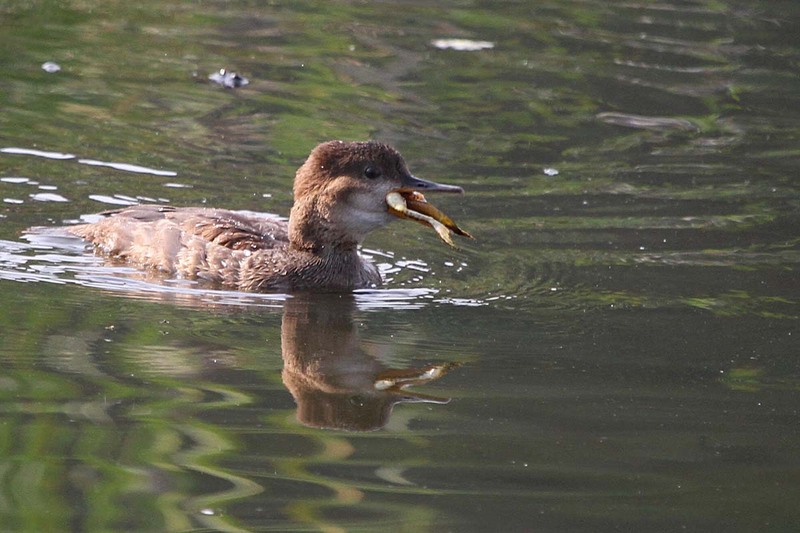 The pictured immature Common Merganser had just downed a crayfish when it spotted a frog which it succeeded in catching and eventually swallowing.